The gut infection Clostridium difficile can be defeated by a cocktail of rival good bacteria, experiments in mice show. When C. difficile bacteria overwhelm the gut, it can be fatal and difficult to treat with antibiotics. A UK team showed a combination of six bacteria could clear the infection. The study, published in PLoS Pathogens, builds on faecal transplant procedures – which are used to introduce competing bacteria. C. difficile bacteria live in many people’s guts alongside hundreds of other species – all fighting for space and food. However, a strong course of antibiotics can kill off C. difficile’s competition. 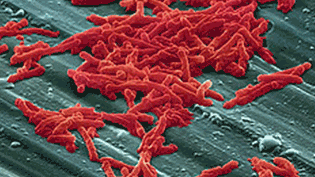 Numbers then explode, C. difficile dominates the gut and masses of toxins are produced. It results in diarrhoea and can be deadly. The main treatment, antibiotics, is part of the problem. It means the condition can be difficult to get rid of and can affect patients again and again.